The month of November is devoted in particular to prayers for the deceased. What was supposed to be a work of mercy in the Amazonas region of Brazil became nothing more than a means of exploitation before the church took the initiative. Aid to the Church in Need helped achieve this transformation. The diocese of Juína is located in the state of Mato Grosso in the central part of western Brazil, an area that is part of the Amazonas region. In this region, a young mother and her small daughter died in an automobile accident. The young woman was survived by a widower and two children. After the diocese of Juína became aware of the family’s situation, it founded a community funeral home called AME (Associação Ministério de Esperança), which rendered its first service for this family. Its staff of volunteers may not have had any professional training, but they were more than willing to help the family. Some of the team comforted and supported the widower. Others made arrangements for the coffins. No structures were in place, which made the task quite difficult. However, the entire process was fuelled by sympathy. Since the family did not have enough money, AME paid for the funeral expenses. The widower was a devout man who later joined the team as a volunteer. The first bishop of the diocese, Franco Dalla Valle, had the idea of founding a new funeral home. He understood that measures needed to be taken to help the people, not only during their lifetimes, but also in the hour of their death. And so he decided to found a community funeral home. The funeral expenses were not only supposed to be kept as low as possible through the work of volunteers, but family members were to be treated humanely and those who were mourning their dead were to be offered the solace of Christian hope. However, the hour of his own death came while he was still developing the project: Bishop Franco passed away on 2 August 2007 before his dream could be realised. However, his project did not die with him thanks to the willingness of volunteers. When Bishop Neri José took over the diocese of Juína, one of his main goals was to continue the projects initiated by his predecessor. With the support of Aid to the Church in Need, the funeral home was one of the first projects to be realised. And so AME was founded. At the beginning, volunteers divided up the tasks that needed to be done amongst themselves. The association took care of poor families, the destitute, indigenous communities, etc. with brotherly love and consideration. Word gradually began to spread about the excellent work of AME – not only in Junía, but also in the neighbouring cities, which began to use the services of the funeral home as well. Even people who would have had sufficient funds decided to use AME because of the emphasis placed by the association on human dignity. Those who had been enriching themselves for years on the pain of others far beyond that which could be considered fair reacted with great displeasure. At the beginning, things were anything but simple. Some of the volunteers were harassed. However, they never stopped believing in the project. AME was not only founded for professional reasons. Rather, it was motivated by the desire to bring peace and the hope of resurrection to those keeping vigil by a friend or family member. The premises of the funeral home consist of one room in which mourners can stay overnight, a common room for family members and a dining room. Even the basic funeral equipment can be used free of charge. Bishop Franco’s idea was so successful that it has been adopted by other cities such as Aripuanã and Colniza. The Asociación Ministerio de Esperanza is a work of mercy. The benefactors of ACN played an important role in its foundation by funding the restoration of the building in which AME is located. ACN also bought a van to transport the coffins. The work of many people has made it possible to replace what was once exploitation with the hope and receptivity of those who volunteer their time to carry out this work with dedication and brotherly love. ACN continues to support the diocese of Juína in Brazil, particularly in the areas of youth work and the pastoral care of the indigenous population. Nine different ethnic groups live in Juína, spread across 150 small villages. “When someone sacrificed his life for something, then it is worth asking why he did so.” Franciscan Father Tomás Ciaran O’Nuanain, an Irish missionary in El Salvador, categorically explains the significance of the research project the Office of Lay Martyrs is working on. The objective is to pay tribute to the witnesses who were murdered during the bloody Salvadoran Civil War. It is also an instrument for the church to examine the recognition of the victims as martyrs. The civil war in El Salvador, as well as the preceding and subsequent conflicts, made the period from 1980 to 1992 one of the bloodiest in Central America. During these years, social injustice and oppression were rampant in the country; labour unions were banned. “It was dangerous to support the farmers,” Father Tomás Ciaran O’Nuanain recalled. According to the Irish missionary, “the clergy was completely divided. It was very sad because many politicised the Gospel. A strong minority supported Bishop Romero and his fight for the rights of farmers. A further strong minority was against this. The others did not take a clear stance. But all of us who fought for the dignity of the most needy were threatened and persecuted.” Father Tomás said. He is coordinating the research project entitled “Witnesses of the Gospel” with five books having been published so far. Nine further publications are planned, one per “departamento” (province) of the country. “With our efforts to look back on and reappraise the past, we would like to pay tribute to and honour the martyrs,” the 73-year-old Franciscan empathically said. He recollected the Christians who fought for justice and bore witness for their faith throughout the various eras. As part of the research project of the Office of Lay Martyrs, information about the lay martyrs is compiled through interviews and archives, their stories are examined and written down so that they do not pass into oblivion. More than 800 testimonies of the relatives or friends of those murdered have been compiled, one example being the story of Noé Arsenio Portillo López. The 22-year-old catechist was kidnapped as he left Mass together with his mother. He was tortured for three days. “The various extremities were severed from his body one after the other before he finally was decapitated,” it is written in one chapter of Witnesses of the Gospel. In an interview with Aid to the Church in Need the Apostolic Nuncio asked for a prayer to be said: “I want to encourage you to ask God for the Holy Father’s enlightenment. Pray for the Pope to open the hearts of all the people so that the Lord will find them ready to receive his message and to renew their lives after the visit. In the interview the Archbishop described the Colombian people as “very warm, enterprising and diligent”. He also talked about the major social rift in Colombia. “There are people starving while others throw away food.” In this context he talked about the contrasts between highly developed cities – such as Bogotá, Medellín, Cali and Barranquilla – and other regions in the country where people live who own practically nothing. “The Holy Father,” the Archbishop explained, “is the father of the rich and the poor. But he is coming here to remind us that Colombia needs the contribution of all. In his language and what he proclaims the Pope plays special emphasis on those who suffer. We cannot live under the same heaven and fail to recognise the other reality as through it didn’t exist.” With this in mind the Apostolic Nuncio used the interview to “thank ACN for its help in enlightening Colombians, in opening their eyes to suffering and to the other Colombia” as well as “for its efforts in ensuring that the Pope’s message reaches the whole country, and especially the marginal areas”. Thanks to the generosity of its benefactors the foundation ACN was able to support more than 64 projects in Colombia to the tune of 700,000 euros in 2016. They are concerned primarily with training 667 seminarians from eleven dioceses and with securing the subsistence of nuns and priests. The regions which have benefited from this support include the apostolic vicariates of Guapi, Puerto Gaitán and Puerto Leguízamo-Solano and the needy dioceses of, among others, Quibdó, Istmina-Tadó, Mocoa-Sibundoy and Málaga-Soatá. Quietly, a young religious Sister enters the noisy bar. She belongs to the congregation of the Little Sisters of the Poor and she is begging for alms. She stretches her hand out to a man, who is notorious for his hatred of the Church, and he spits in her face, laughing derisively. Quietly, she wipes her face and says, ‘That was for me. Now will you give me something for the poor?’ The mocking smile dies on the man’s face and his eyes open in wonderment. He asks her pardon and gives – more than she had dared to hope. Bishop Raul Castillo of La Guaira, Venezuela, is happy to tell people this true story. It takes a lot of courage, he says, to put your dignity in your open hands and beg. But, as he also knows, ‘Christ comes begging with us.’ For here it is about ‘God’s first love, the poor’, as Emeritus Pope Benedict XVI puts it in his book on Jesus of Nazareth. The 19 young men in Saint Peter’s Seminary in La Guaira are well aware of this. They see the poverty in the country, the lack of basic necessities and the widespread violence. They themselves suffer from the same shortages and Bishop Raul has asked for help to provide them with the barest necessities – soap, eggs, milk, flour, paper. As for money, they have none, and in any case it would be of little worth, for inflation here is the highest in the world today. Money from abroad would help them to address the material needs and at the same time prepare for the growing spiritual need. Many of the seminarians have themselves known past sorrow and suffering. When Luis Carlos felt the call of God, he was already engaged. The parting was not easy. Fellow seminarian Caesar Rafael suffered cancer of the lymph nodes at the age of 10. He underwent chemotherapy, but then when he was 14 the cancer returned. This time the chemotherapy was followed by radiotherapy. Since then, he seems to have been in good health. He gave up his studies in machine engineering after two years and entered the seminary. Another student for the priesthood, Esteban Marcanos lost his mother when he was just one year old. He was brought up by his father in his grandparents’ house. Then his father died when he was just 16. Yet he never ceased to believe in God’s love, and today he is training for the priesthood. No one knows what will happen to this country in the future. But one thing is certain: without the Church the spiritual poverty will continue to increase. Luis, Caesar and Esteban want to combat this with the sacraments, the signs of God’s love. And this too is what the 20 young men in the seminary of the Mother of the Redeemer in Carupano are preparing for. They also have no fear of the future, although they too lack even the barest necessities. We have promised to help both Carupano and La Guaira. 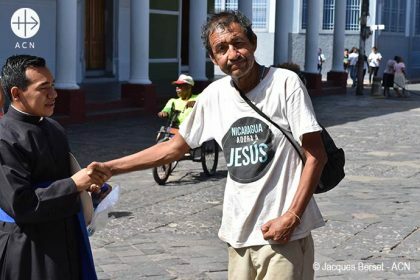 Our aid will help them towards their goal, expressed in the words of Pope Francis: ‘Our preferential option for the poor must mainly translate into a privileged and preferential religious care.’ (Evangelii Gaudium, 200). In her ‘Prayer on growing older’ Saint Teresa of Avila says: ‘Lord protect me from gloomy saints. Keep me reasonably sweet, for a sour old person is one of the crowning works of the devil’. The discalced Carmelite Sisters of Barquisimeto in Venezuela are not necessarily all saints, but old and sour they certainly are not – rather they are all loving and affectionate. And yet these daughters of Saint Teresa do not have an easy life. Barquisimeto’s eleven Sisters also suffer from the poverty afflicting their once oil-rich country, which has been brought to its knees by political and economic mismanagement – and a social crisis bordering on civil war. The worst thing for them is the lack of medical supplies, which two of the Sisters depend on for their lives. Many foodstuffs are largely unobtainable and even water is in short supply. Moreover, they have no running water, and they cannot afford to bore a well in the convent grounds. Meanwhile, there is a growing climate of superstition and idolatry in the country, involving the theft of human organs and bones obtained through the desecration of graves. To avoid this danger, the Sisters have had to remove the mortal remains of their deceased foundress and fellow Sisters from the public cemetery and laid them in a place of safety. ‘Through our prayers we are co-workers in the Kingdom of Love, even in this world’, writes their 37-year-old abbess, Mother Isabel. Five of the 11 Sisters are younger than her. Without outside aid they could not fulfil their vocation and mission of devoting their whole lives to God in prayer. 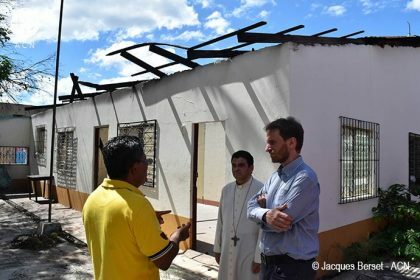 ACN is determined to provide the Carmelite and Trappist Sisters in Barquisimeto the little they need to survive. It is likewise a matter of survival for the Carmelite Sisters in Sebikotane, in the Archdiocese of Dakar in Senegal. Again, as Archbishop Benjamin Ndiaye assures us, their prayer is ‘an enormous support for the diocese, and especially for the seminary where Senegalese priests have been trained for generations’. But the Sisters need a car, to transport the vegetables grown in their convent garden and the chickens they raise to the market in Dakar, 30 miles (50 km) away. This is the main way that the Sisters, who come from Ghana, Sierra Leone, Togo, the Cape Verde Islands and Senegal support themselves. The old car is now worn out by and costing them too much in repairs. We have promised them a new car. In September 2017 vast areas of Cuba were struck by Hurricane Irma. The island was pounded by winds gusting up to 160 miles (250 km) an hour, torrential rainfall, tidal surges with waves of up to 30 feet and widespread flooding. At least 10 people lost their lives and there was extensive damage across wide swathes of the country. And while hurricanes are no rarity in this region, Hurricane Irma was more powerful than anything people here have experienced for decades. 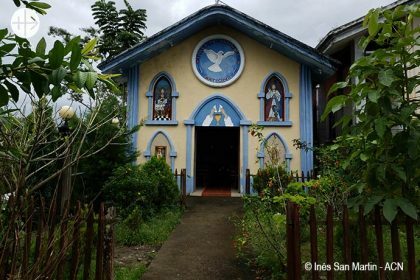 In the archdiocese of Camaguey, for example, one chapel was completely destroyed, three churches were left in danger of collapse and five other churches and chapels suffered severe damage. The hurricane raged for nine hours, and thousands of people had to be evacuated from their homes. Just as soon as the worst of the hurricane had passed, Archbishop Wilfredo Pino Estevez was out, examining the scene of the devastation. In the town of Esmeralda, which was particularly hard hit, he found the church totally destroyed. Although it was still raining heavily, he stood on the spot where the Church had once been and spoke to a married couple there. The woman, whose name was Ismaela, said to him, ‘Well, Bishop, the chapel may have collapsed, but not the Church.’ For of course the Church is not merely a building of stone, but the living Body of Christ, which no storm can destroy, even if the buildings collapse. Now the time has come to start rebuilding. Archbishop Wilfredo is concerned above all for the people who have been left homeless and consequently he has asked ACN to help him purchase 6,500 corrugated steel roofing sheets. 5,000 of them will be given out to those who need them, so that their families can once again have a roof over their heads. The rest he intends to use to repair the damage on some of the churches and chapels. We are helping him reflect Christ’s light in Cuba.